Of all the samples I was sent from Liz Earle… this is the one (and only) product that I would happily repurchase without any hesitations. It’s also the one I thought I would like the least. The one I thought I’d like the most… didn’t do it for me (review coming soon!) and although I love, love the Superskin Moisturiser… that £32.50 price tag puts me off. Liz Earle Instant Skin Boost Tonic is a toner, something I never use. It seems like one of those superfluous steps to a routine that I barely have time to squeeze in to my day anyway. Not only that, but it also contains Aloe Vera… an ingredient I always avoid because I hate that slightly tacky feeling I find Aloe extracts leaves on my skin. Now… when I think of ‘toner’, I think of ‘cleansing lotions’… which I hate. I’m a washer (we’ve had this discussion before), I dislike faffing about with bits of cotton wool when all I want to do is go dribble on my pillow for 8 4 hours. The thing is though, this feels like a treat, an indulgence if you will. I like indulgences. I find the Instant Boost Skin Tonic entirely refreshing and after using my cleansing oil, it ensures that every last scrap of oily residue is removed. The slight tackiness lasts no longer than a minute or two before fading and although I can’t pinpoint any specific skin benefits, I am noticing slightly odd things like my moisturiser absorbing more effectively. I’ve decanted some of my bottle into a spritzer and I’m also using it to set my makeup or to simply refresh my skin mid-afternoon. It has a beautiful floral scent that practically screams “countryside!” (minus the cow pats) and which I find quite calming in an admittedly pappy arometherapeutic (is that a word?) kinda way. It doesn’t leave any unpleasant tingly sensations behind, the slightly-thicker-than-water texture just soothes and cools. I’m excited to use this in the Summer, I think it’s gonna be amazing after an afternoon in the sun (if we have any). I should point out that I am actually a die-hard fan of The Body Shop Vitamin E Face Mist for all the same makeup setting/face spritzing reasons above, but I’ve never liked it much as an after-cleansing experience because unlike the Liz Earle, my Body Shop face mist dries me out if I apply with cotton wool. I think it’s the alcohol, which the Liz Earle Instant Skin Boost Tonic doesn’t contain. Ml for ml, the Liz Earle works out cheaper than The Body Shop’s Vitamin E Face Mist too. Bet you didn’t see that one coming did you? I didn’t! 200mls of The Body Shop’s alcohol and paraben-filled (5 of the 14 listed ingredients are parabens) face mist will set you back £14. The equivalent volume of alcohol/paraben free Liz Earle Instant Boost Skin Tonic? £11.50. Awesomesauce. I don’t actually like to be proven wrong. I didn’t think I’d like this, I’ve extolled the virtues of The Body Shop Face Mist to you all for a long time. But from now on… my money’s going to Liz Earle. Oooh, now I want to try this. Can this be purchased in the US? I just wish it had a spray though, would make it 100 times more useful wouldn’t it. x Great review. It’s worth keeping an eye on the Liz Earle Outlet on Eaby, where they sell stuff with damaged packaging. No Superskin Mouisturiser for you there at present though! 200ml Instant Boost Tonic is currently £2 cheeper. @ Sarah – I have the 30ml spritzer, but I see on the main site they now also do a 200ml spritzer version as well. All be it for 25p more than the standard 200ml. @liloo – yes, I do think some of TBS products are overpriced… but as I learnt recently, sometimes the prices need to pay for the community projects they have going on and generally being a more ethical operation. It’s an endless dilemma… Do I wanna pay more to take part in ethical shopping? Or do I want to pay the least amount of money for my stuff. I’m 50/50… depends if I’ve got much money in the bank that month! Oh I love this too, I use it as a spritz over my fading makeup, I guess as an equivalent of Fix +. The smell is divine and i agree with you, it doesn’t feel tacky and I feel like it helps absorb my moisturizer too. Great review, loved it! This is a great toner, I love the smell too – love the description you’ve given it! I’m using this at the mome too. I love the spinny lid! 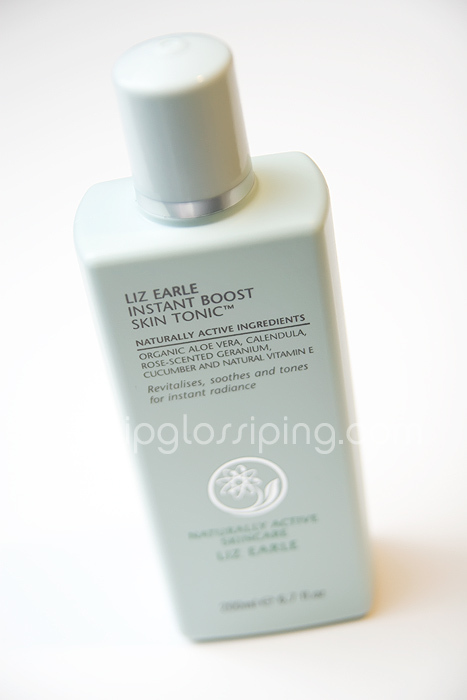 Liz Earle Instant skin boost tonic is a perfect skin toner for my skin. I have never been I favour of using skin toner, but this product just changed my views. With its lovely fragrance, gentle and refreshing action on the skin, I actually look forward to come home, wash my face and use the toner. It makes my skin look exceptionally rejuvenated and young.